Melbourne Wedding Designers pride themselves in designing and dec﻿orat﻿ing simply stunning weddings and events. Their talented team of designers are there to help you design and create your perfect wedding using colours, themes and ideas to suit your style and budget. They have an extensive range of products in stock, but if you don't see what you are looking for, please ask! They are always open to suggestions and when possible, are open to customising items or adding to their range. Their services include delivery, set up and pack down, leaving you to enjoy the day completely, knowing everything is taken care of. Whatever your dream wedding, they will strive to design and create it for you. With Melbourne Wedding Designers, your dreams really do become a reality. "Steve and I would like to say thank you, thank you and thank you Shenelle Cole for making our wedding reception magical. Your centrepieces were exactly as we expected... magnificent and breathtaking. Also the special service offered to deliver and pickup on the same day made our special day stress free. We would highly recommend Melbourne Wedding Designers to all our friends and family. Shenelle has always had a passion for all things creative. She has had 7 years previous experience in visual merchandising, learning many creative skills and techniques along the way. Having loved every minute of putting together her own wedding, she started to think about the idea of being a part of helping others to achieve their perfect day too. And so, with the help and support of her family, she started up Melbourne Wedding Designers in July 2012. Since then, Shenelle has put together an amazing team that really prove themselves time and time again with outstanding results. "Shenelle and her team are not only lovely to deal with, but they are efficient and very thorough with their work. My husband and I hosted an intimate garden wedding at our own home. We chose to use our garage for extra space and shelter for our guests. We also organised a photo booth which we had set up indoors (without a doubt the highlight of the night)! Our home was completely transformed and looked like a fairytale! It was absolutely magical! I still can't believe how wonderful everything looked - it was absolutely perfect and I cannot thank Melbourne Wedding Designers enough for their efforts. Imagination, dedication, and sensational results! I cannot recommend this company enough!" 'I would just like to say a big THANK YOU for the amazing work you did for our wedding. The reception centre looked absolutely stunning with your candelabras and table number frames, as well as the wishing well table. We had endless compliments all night & still receiving great feedback almost a month after the wedding. Thanks again for your great work. You will be highly recommended as I have a few friends getting married in the near future. "The centrepieces from Melbourne Wedding Designers I hired for my recent wedding in Jan 2014 were fantastic. They looked absolutely beautiful and I'm so grateful that I found this company as Shenelle, you helped me so much. When I walked into the reception on our wedding day I was gob smacked. It looked beautiful and everything came together so well. I will definitely recommend you to anyone who needs centrepieces, and wouldn't hesitate to tell them how helpful and professional you and your company are. Everyone commented to me how beautiful the table settings looked, so I know I made the right choice after all my googling. Again I say thank you for everything, it was very much appreciated." "Phil and I wanted our wedding day to run smoothly and look beautiful, so we enlisted the help of the very talented Shenelle Cole and her team at Melbourne Wedding Designers to assist us. The evening was beautiful and one of the highlights for many was the amazing effort put into making the venue look amazing. No detail was left behind and the professionalism was clearly evident. Nothing was too much to ask, and the room looked stunning. Thank you so much Shenelle, you made it a night we will never forget!!" “We just wanted to say a big thank you to Shenelle from Melbourne Wedding Designers for making our wedding reception look like something out of a fairytale. The beautiful ceiling drapes and fairylights took the room to a whole new level, and created a romantic and magical atmosphere. Shenelle was so great to communicate with, and took care of everything, from the setting up and installing of the drapes, to the pack down - my partner and I didn't have to worry about a thing! We have no hesitation in recommending Melbourne Wedding Designers; we can't thank you enough for all your effort in making our wedding all the more special. 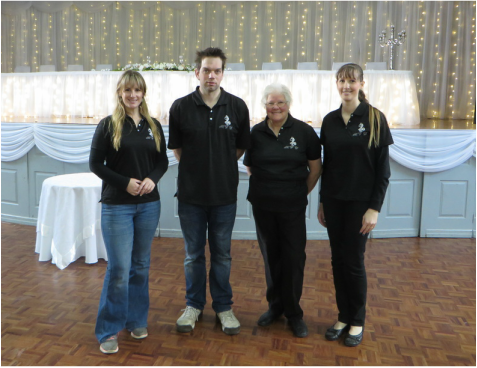 "Thank you so much for organising the decorations for our big day. You did such an excellent job and made the process seamless and easy. I cannot thank you enough for the small personal touches and making vision a reality." "The fairy lights for our wedding were simply delightful! They were exactly what I envisioned! Absolute perfection! Thank you so much for your time and efforts! Thank you so much for everything!" Manish and I would like to say a huge thank you and your family, for doing such a seamless job at our wedding. Our reception was magical because of the lights. You came, set up and left, all without a hitch that I even forgot I ordered lights! Haha! "